Sunday! Sunday! Sunday! – MNLT Demo Party! This entry was posted in Uncategorized on September 22, 2014 by walltree. And the reviews are starting to pour in!! Jason “Polar_Bear” Koepp just finished up his review of Monkeys Need Love Too. After reading the review, I can certainly see why this guy is the Editor in Chief over at Tabletop Gaming News. He has a very unique way with words. But don’t take my word for it. Click here to read the review for yourself. After your done with the review, make sure to check out everything else TGN has to offer on their site. They have almost everything you want to know about what’s going on in the world of tabletop games right there in one convenient location. Make sure you read to the bottom of the review as well. 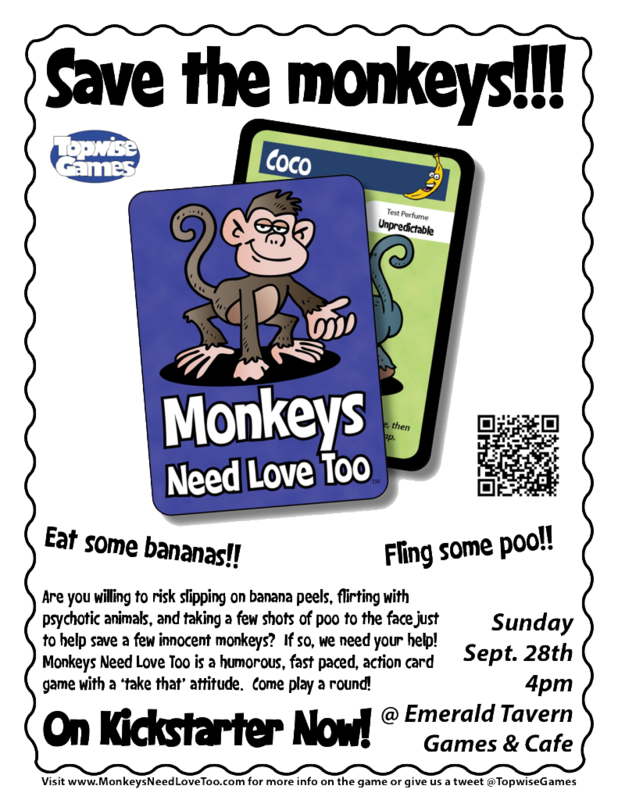 Jason’s is giving away the demo copy of Monkeys Need Love Too to one lucky reader. This entry was posted in Uncategorized on September 3, 2014 by walltree. Game Reviewer Jonathan Nelson over at Gaming Bits completed his review of Monkeys Need Love Too today and we couldn’t be happier with the result. We’d like to personally thank Jonathan for taking the time to test out the game and give us his valued opinion of how it played. Click here if you liked to read what he had to say. Jonathan also posts his reviews up on Boardgamegeek.com, so if you’d like to read the review at BGG, click here. This entry was posted in Uncategorized on August 29, 2014 by walltree. In preparation for our upcoming Kickstarter launch next week, the game reviews for the game have started to come in. First in is one from Board Game Duel. They have been so awesome during the development of Monkeys Need Love Too. They’ve provided valuable feedback on how the game plays and have been most gracious when working with our upcoming Kickstarter timeline. They give you comparisons on the 2-player versus 4-player playability of a game, but also give out their base opinion on how the game plays in general. Click here to read what they had to say about Monkeys Need Love Too. This entry was posted in Uncategorized on August 28, 2014 by walltree.